In a quiet corner of the Tuscana district of Sarasota, deluxe builder Medallion Home is developing a boutique community that intends to offer a new concept in luxury and residential style. Waverley in Sarasota is located near the intersection of Proctor Road and Hand Road, about half a mile east of I-75. Medallion Home is currently busy building 110 single-family homes that will lots of space and luxury. The homes in Waverley will feature three to five bedrooms in floor plans measuring between 2,395 to 4,686 square feet of living space. The builder has selected seven premium floor plans for Waverley. The architectural style in this neighborhood is a mix of Mediterranean and Caribbean home designs. The coziest model is the Aruba; this floor plan offers three bedrooms, two bathrooms and a three-car garage. Some of the features and upgrades of this model include: breakfast nook, covered lanai, walk-in closets, separate dining room, optional swimming pool, and more. Pre-construction pricing for the Aruba as of March 2017 is under $527K. The most stately floor plan at Waverley is the Bimini, which features five bedrooms and four bathrooms arranged on two levels. The Bimini has many extras such as fireplaces, a bonus room that can be used as a studio or as a den, a large patio with a covered section, and a space to set up a home theater. Initial pricing for this model as of March 2017 is $724,600. Medallion Home has chosen an excellent location for this neighborhood. Three Publix supermarkets can be found within a mile radius: Bee Ridge, Northridge and Centergate Village, which is part of a shopping district that includes a Home Depot as well as a Walmart Supercenter. Driving to the beach is a matter of driving west on Clark Road for about 30 minutes, and Downtown Sarasota is also half an hour away. 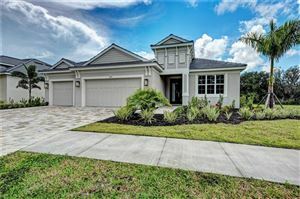 See all Waverley Sarasota Homes for Sale.